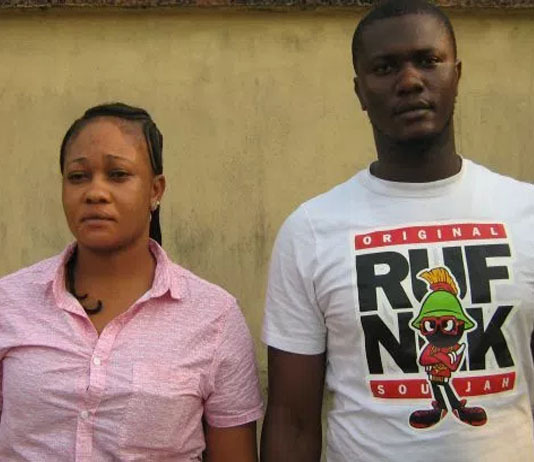 Two siblings, identified as Chukwudi Ugwueke a.k.a James Scott and Sophia Ugwueke, have been sentenced to two years in prison each for Internet fraud in Warri, Delta, according to the Economic and Financial Crimes Commission (EFCC). The spokesman of the commission, Mr Wilson Uwujaren said they were sentenced by Justice E. A .Obile of the Federal High Court, Warri, but were given an option of N400,000 fine each. EFCC operatives arrested the convicts at their residence in Sapele, Delta, in January based on intelligence on their illegal activities bordering on defrauding foreigners through Internet scams. They were first arraigned on Feb. 1 on a 13-count charge, but pleaded not guilty, according to the EFCC spokesman. However, when the case came up for hearing on May 11, they pleaded guilty to an amended one-count charge of possession of fraudulent documents with intent to defraud one Lisa Marie Nors, an American.